Between 1989 until 1994, I was motivated to find out how artists worked and lived, as I had decided to pursue my art full time and wanted to see how others had achieved this lofty goal. The very first portrait was that of my professor at the University of Victoria, Dr. Pat Martin Bates and it was first exhibited at the Edmonton Art Gallery. 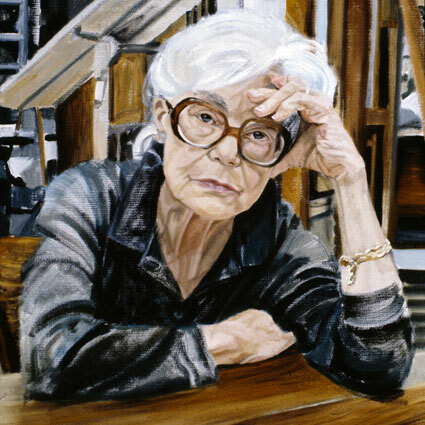 Because of this painting, Myfanwy Pavelic granted me the honor of being the only painter to paint her portrait as she herself, had painted Pat Martin Bates numerous times. Because of this painting, Douglas Udell gave me a solo-exhibition at his gallery and it launched my career as a portrait painter. Upon moving to Victoria, BC I decided to pursue this same theme. I met and painted Robert Bateman, Fenwick Lansdowne and Carole Sabiston, amongst others, with this exhibition being held at the Barton-Leier Gallery in 1994. In all, I painted 29 canvases, and they are owned by Universities, Corporations, some of the artists themselves. The project proves how one painting can start an avalanche of work and opportunity. Shown: Myfanwy Pavelic (top), Irene Klar (bottom left), Len Gibbs (bottom center) and Danek Mozdzenski (bottom right).